Remember, remember the 5th of November: gunpowder, treason and plot! The 5th of November is widely known as ‘Bonfire Night’, a time to cuddle up with buddies next to a roaring bonfire, watch the fireworks in the night sky, eat melting marshmallows and drink hot chocolate. 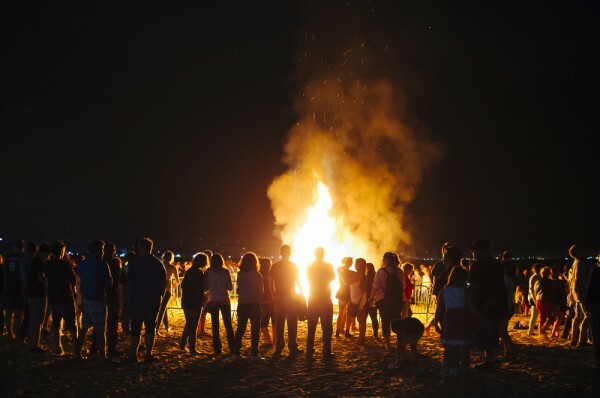 However, it can be too easy to forget Bonfire Night actually commemorates the capture of Guy Fawkes, the rebel who tried to blow up parliament and kill King James I.
James I came to the throne following the death of Queen Elizabeth I. By continuing Elizabeth’s hostility towards the Catholic church, James became instantly unpopular with Catholics around the country, especially since he had been raised by a Catholic mother himself. In anger at his apparent betrayal, a small mob of 13 Catholics plotted to blow up the Houses of Parliament, assassinating the King in the process. The plot was relatively simple: over time the group stored barrels of gunpowder in the cellar directly underneath the House of Lords, ready to ignite on the 5th November during a Parliament session. However, as the date approached it began to dawn on some of the group that they wouldn’t just be killing the anti-Catholic members of Parliament, but also the innocent men inside the building. Legend says that one member of the group sent an anonymous letter warning his politician friend to stay away from Parliament on the 5th. This letter was passed to the King, who immediately took action. In the early hours of the 5th November the authorities stormed the cellar, finding thirty-six barrels of gunpowder as well as that night’s unlucky guard – Guy Fawkes. Fawkes was caught, tortured and executed; the barrels were removed, and Parliament was safe. The reaction of the British public was to celebrate the safety of their King by lighting huge bonfires across the country – thus cementing the title ‘Bonfire Night’. As the years passed the tradition of burning an effigy of Guy Fawkes began, and fireworks were added to the celebrations. The tradition spread around the world over the centuries, and is now celebrated in many other countries including New Zealand and Canada. Over in Dunchurch, a small village just outside Rugby, you can see the house named (incorrectly) ‘Guy Fawkes House’! The old Red Lion Inn never belonged to Fawkes, but is where the gunpowder plotters met as their plot unravelled. From here they were supposed to go on to Coombe Abbey where James’ eldest daughter Elizabeth was being taught. As we know, their plans were scuppered and the group disbanded, defeated. Dunchuch is only a short drive from Coventry, so give it a visit, it’ll be sure to get you into the Bonfire Night mood. Read UnCOVered’s blog if you’d like some ideas about the best firework displays around Coventry. And let us know if you know any more Guy Fawkes legends!